↑ "Shaw's Academical Dress of Great Britain and Ireland 3rd Revised ed. Edition". Amazon.com. สืบค้นเมื่อ 16 August 2017. ↑ "Shaw's Academical Dress of Great Britain and Ireland - Volume II: Non-degree-awarding Bodies (Volume 2)". Amazon.com. สืบค้นเมื่อ 16 August 2017. ↑ 6.0 6.1 "Statues and Ordinances of The University of Cambridge Chapter II" (PDF). 2017. ↑ "IMPERIAL COLLEGE LONDON: ACADEMIC DRESS" (PDF). ↑ Michael Cottrell (2008-06-12). "The Australian: King's bans mortarboards as old hat". Theaustralian.news.com.au. สืบค้นเมื่อ 2010-04-28. ↑ "Secretariat Coporate Service: Gown". University of Leeds. ↑ 14.0 14.1 "Gowns and Dress Code". Brunel University London. 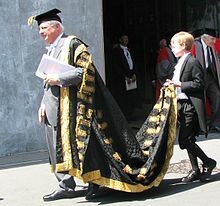 ↑ 15.0 15.1 "Regulations relating to Academic Dress made by the Vice-Chancellor, as Authorised by Council". University of Oxford. 2002. ↑ "Academic Dress". University of Oxford. ↑ "University Calendar:Section IV : General Information and Regulations". University of Southampton. ↑ "Schedule of General Regulations:XIII Academic Dress". University of Manchester. หน้านี้แก้ไขล่าสุดเมื่อวันที่ 1 กุมภาพันธ์ 2562 เวลา 07:33 น.